Submitted by via Hayle devel... on Wed, 23/05/2018 - 11:21. 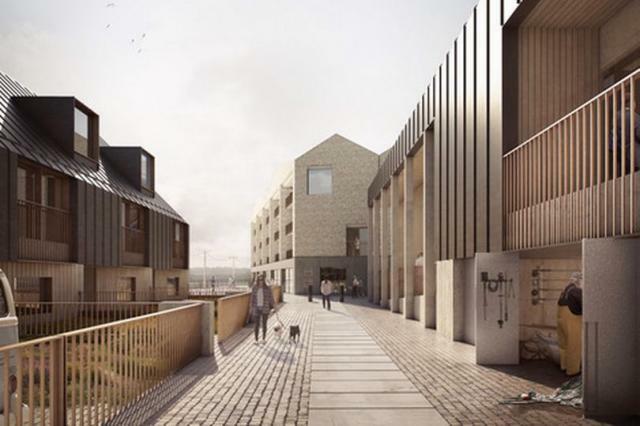 These are the latest images of a planned development including 175 homes on historic Hayle Harbour. Developer Sennybridge has submitted detailed plans for the site which will include apartments and wharf houses along with restaurants, workspaces, shops and a new public square. An application to revitalise Hayle's North Quay was originally given outline planning permission in 2010, and the new application gives details for the quayside. North Quay sits in a UNESCO World Heritage Site. The plans were drawn up in co-operation with Cornwall Council, Hayle Town Council, the World Heritage team and Historic England. A public exhibition held last year saw support from people for the proposals. Matt Williams, Associate at architects FCBStudios said: “The challenge of managing a post-industrial future for Hayle Harbour, which mixes residential requirements with the operational needs of a harbour is immense. The operation of the harbour and the use of the fishermen's quay shaped our thinking. We referred to how the coal wharf looked in its heyday, and before it closed in 1977 to inform how the space could be used, in the most imaginative way possible." The planning application has been submitted to Cornwall Council which will make the final decision on the proposals.